Buy 10 Christmas Pudding/Snowmen Cake Pops from our Christmas Cake Pops selection. Moist vanilla sponge dipped in coloured milk chocolate and lovingly decorated with fondant icings. Freshly made to order using the finest ingredients, with Baileys Irish Cream. Each Christmas Pudding and Snowmen cake pop is wrapped in cellophane with a twist and boxed together. 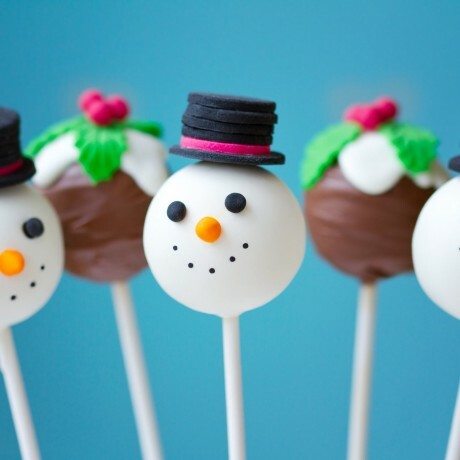 Makes a fantastic Christmas festive gift for cake pops lovers. Fine vanilla moist sponge cake crumb particles are delightfully blended with rich butter cream frosting and a very generous pouring of Baileys and formed into cake pops by hand. A cake pop stick is inserted before being given a generous thick coating of chocolate flavour melts. Edible Christmas decorations are added for drama.